2. 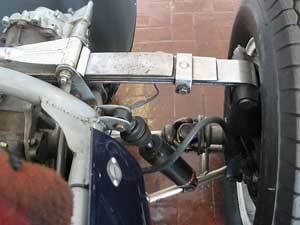 Double Wishbone with coil or torsion bar springs. The GT6 has Double Wishbones with coil springs at the front, and a transverse leaf spring at the back. 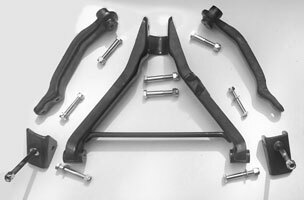 This is by double wishbones and coil springs, where two wishbone shaped arms are connected from the chassis to the front hub assembly, or trunnion. 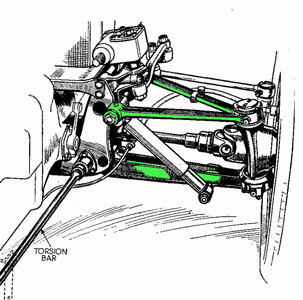 The wishbones arms can be solid, but in the case of the Triumph, the upper arms are split into 2 although each part cannot operate independently of the other (see green highlighted areas in the parts diagram below). 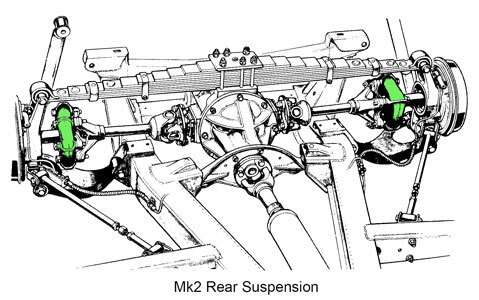 The shock absorber is mounted inside the coil spring, both of which are located on the lower wishbone and the chassis. The Standard 8/10 and all TR sports cars all have wishbone front suspension. 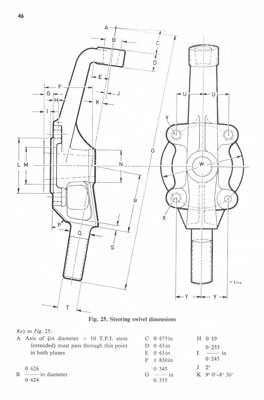 An interesting feature is the "upright" or Vertical Link, see below (drawing from Olyslager motor manual for the 1956 Standard 8 & 10). This was introduced with the 1938 Standard 8 (yes, the prewar one!) and is also known as the Alford & Alder upright. This Hemel-Hempstead based company (which was ultimately absorbed into Standard-Triumph) designed and manufactured this upright which is famous for its use in many racing cars including three world championship winners - the 1959 and 1960 Coopers and the Brabham-Repco BT20 of 1966. It is still used to this day in the Caterham Seven. For more information look at my 'Articles' page or click here. Recently I came across an article in Classic & Sportscar about the late 1960s Maserati Ghibli. This was described as having Alford & Alder front suspension, so these vertical links were even used in some Italian exotica! The rear suspension uses a transverse leaf spring and swing axles. Sometimes referred to as 'semi-elliptical' or 'cart springs', a typical leaf spring is made up of a cross-section of rectangular cut spring steel 'leaves' which are bent and fixed together to form an arc shape. The majority of leaf springs have a longest leaf or 'main leaf' where the ends are heated and rolled to form circular shapes called 'eyes'. These eyes allow the spring to connect to the vehicle body while the centre of the spring allows location to the axle. Normally below the main leaf are a number of leaves which are usually progressively shorter, however in the case of the small chassis Triumphs, the shortest leaf is at the top. A leaf spring can be made up of a single leaf or over 20 leaves depending on the application. 1. 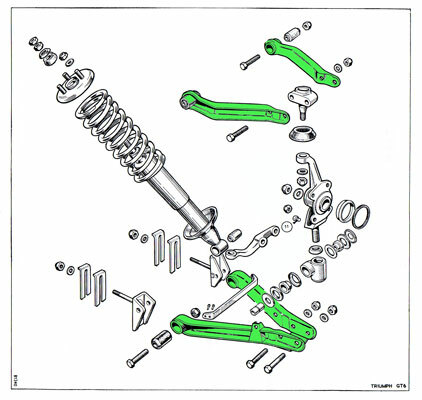 The The "swing spring" pivoted the transverse rear spring on the differential, so that the body could roll more than the suspension, without impairing the ride in a straight line. 2. A fully controlled rear axle, with a lower wishbone (reversed) and a rubber coupling or doughnut (Rotoflex) at the outer end of the drive shaft, but that was no longer a swing axle. 1. Above is used in the later GT6 Mk3 as well as the Spitfire Mk4/1500. 2. Above is used in the Mk2 and early Mk3 GT6. Please refer to the Rotoflex section of this website for details of this rubber coupling. Transverse rear springs used as top locators for the rear hub, along with lower wishbones (GT6 Mk2 and early Mk3) were used in the 1957 Cooper T43 Formula 2 Racecar which was designed by Richard Maddock. The rear suspension can be seen below, the similarity to the GT6 is marked, with the upper transverse spring located on the transaxle (axle in the case of the GT6) and a lower wishbone (tubular steel in the case of the Cooper, cast aluminium in the GT6).